Increasing material removal with fewer passes in 5-axis machining, circle-segment tools offer more than 80% cycle time reductions and up to 50% smoother surface finishes. Circle-segment tool end-mill designs feature forms with large radii in the cutting area of the mills, allowing a larger axial depth of cut during pre-finishing and finishing. Circle-segment end mills will be on display at EASTEC in booth #5349 along with cut & form solid carbide finishing end mills featuring tool geometry that cut and polish in one operation. Dual functionality comes from a design that incorporates three cutting edges to remove material and three burnishing edges to compact the material, producing polished mirror surfaces as fine as 0.08µm Ra. Designed for vertical machining centers (VMCs) running fewer than 20 parts, OneLOK vises improve speed, precision, and versatility by clamping parts with precise repeatability and in short setup times. The BoltFast jaw system shaves jaw-change times as only one screw turn is needed. OneLOK is nearly half the weight of traditional vises, and its ergonomic handgrip makes handling simple. A sealed design prevents chip traps for cleaner operation, eliminating messy part changes or lost small workpieces. The QwikSlide jaw moves with ease for rapid setup and part changes. NCSIMUL Machine CNC software provides realistic simulation of the machining process. Users can simulate, verify, optimize, and review programs based on the actual characteristics of the machine tools. Three-dimensional graphics help avoid machining crashes while algorithms and process-based knowledge enable optimization of cutting conditions. Also on display at EASTEC in booth #5522 will be NCSIMUL 4CAM, a module that streamlines the existing CAM process to simplify CNC programming. In one click users can change the target machine without any reprogramming efforts. From the main CAD/CAM program or machine controller G-code, NCSIMUL CAM generates programs for any verified and optimized machine tool without an external post-processor, taking into account kinematics of the machine tool, controller, cutting tools, and conditions. The G200 turn-mill center delivers up to 30% more productivity in the same footprint as earlier generations. The redesign increases maximum turning length to 660mm, includes a higher performance milling spindle, expands live tools, and adds XPanel with Industry 4.0 readiness. The virtually arranged machine bed makes the machine taller and extends into the work area, permitting a second lower tool carrier to increase machine productivity. Identical, fluid-cooled main and counter spindles feature a 65mm bar capacity (chuck diameter max. 165mm). Motorized spindles allow productive turning at 31.5kW/32kW (100%/40% duty cycle), 125Nm/170Nm torque, and 6,000rpm maximum speed. Two, 14-tool turrets are arranged in mirror image, each with an independent Y-axis (±45mm). All tool stations can be equipped with live tools, or tools with an internal coolant supply (up to 80 bar). The upper tool carrier, which has an additional Y-axis (±65mm) and a 360° swiveling B-axis, is designed on one side to provide 14 more tool positions with a milling spindle on the rear. Its drive delivers speeds up to 7,200rpm (power 22kW, torque 52Nm at 25% duty cycle). The upper turret head can be swung into a horizontal position above the B-axis, then moved into the work area up to 30mm below the spindle center. In this position, the turret can machine toward the main or counter spindle – even simultaneously – depending on the application. Lower tool carriers parking positions are designed to move to the left or right outside the work area to avoid collision, allowing the other tool carrier to work freely across the entire turning length. The 845mm slide travel of the upper tool carrier is dimensioned in the Z-axis so the tool covers the complete turning length of 660mm – without having to rotate the B-axis by 180°. GTB Series servo positioning rotary tables, part of DESTACO’s technical partnership with Techno Dynamics Inc. (TDI), feature a roller-gear drive and a lifetime-lubricated solution engineered to deliver high torque with high speed and motion flexibility. Available in four models – GTB40, GTB63, GTB80, GTB100 – the GTB units are 34% shorter and 64% lighter than competitive models, while being able to deliver 1.4x the torque. CarvLock workholding towers, with 8 or 12 clamping stations in both manual and hydraulic models, are available with easily changeable jaws. 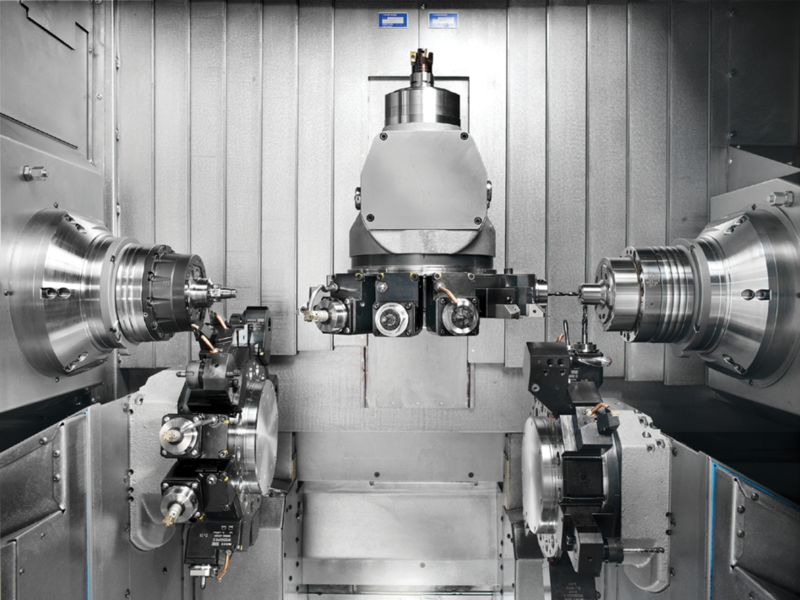 Designed for use on mid-size and larger horizontal machining centers (HMCs), each tower station has either a 3" or 4" jaw opening and provides repeatable clamping to 0.0002" with a maximum clamping force of 5,870 lb to 7,460 lb, depending on the model. CarvLock Towers feature self-adjusting holding blocks for clamping the same or dissimilar-sized parts. Fast manual operation is enhanced with the adjustable pre-load feature that reduces handle turns for opening and closing clamping stations. Hydraulic CarvLock Towers achieve fast part clamping by eliminating manual clamping. The elevated column design ensures fast, easy clearing of chips and coolant. Kurt Mfg. Co., Industrial Products Div. Model LV-1 and XV-1 micro abrasive blasters, designed for production lines and in SWAM (software asset management) automated systems, feature an hour meter for SPC monitoring and tungsten carbide fittings for long service life. These machines hold approximately 20 lb of aluminum oxide and have a separate mixing powder tank for a consistent powder feed rate from full tank to empty. Blasting begins after a part is loaded into the chuck or collet and a dual-button foot switch is pressed. Reciprocating or stationary nozzles uniformly abrade the rotating part. UNO Smart entry-level tool presetters feature a small footprint, user-friendly operation, and high precision. Repeatability is ±5µm, and direct data transfer and repeatability is ±2µm. The UNO’s Autofocus allows users to take advantage of enhancements, such as a 22" touch screen, edge finder, and motorized fine adjustment of the C-axis for precision in demanding measurements. Automated presetters use the Microvision image processing system that measures and sets tools quickly, precisely, and independently. Modern image processing ensures that the tools are measured to guarantee high quality production. Microset tool presetting equipment streamlines tool setting processes, reduces setup times up to 70%, minimizes idle time, and increases machine use.